When Monkeybrain debuted in July 2012, I took a little time to feature a review on each of the debut titles, which I called "Monkeybrain on the Brain." Now it's home to Eisner winners and creators ranging from Kurt Busiek to Jen and I figured that now would be as good a time as any to revisit the line. Over the course of November, I'll be featuring different Monkeybrain titles, both new and old. You can find them under the Monkeybrain tag, which includes links back to the ones I did initially. 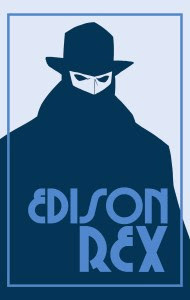 Obviously, I was quite a big fan of the first six issues of Edison Rex, which I reviewed here for Newsarama, in case you missed the first post on this series. But what did I think of the rest of the series, which just hit issue 11 this past Wednesday? If anything, after finishing these newest stories, I like this series even better than I did before. Roberson and Culver are knocking it out of the park in every single issue, coming up with new and innovative ways to play upon the Superman-Lex Luthor dynamic that drives the background of this series. Edison Rex is about what happens when Superman dies and Luthor jumps into the breach to take over his heroic mantle. The first issues established Rex's change and how he would react to the situation he's always felt should exist in the first place. Now, in these stories, we begin to see how the rest of the world is reacting to Rex. 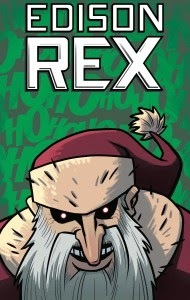 For example, in issue eight, an evil version of Santa Claus shows up, and Rex pairs up with a legacy hero who isn't sure at all about Rex's motives. Eclipse III and her predecessors play key supporting roles in this new arc, as Roberson and Culver build up the world of their creation. 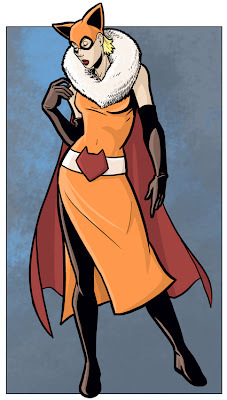 She returns in issue ten, which finds Rex on trial by his villainous peers for turning against them. Look at how you're drawn to those eyes! Issue ten shows just how well Roberson understands the world of DC superheroes, and makes me so frustrated as I think of what the New 52 might have been like with his guiding hand. (However, it should be noted that I completely understand Roberson's position and had he done that, we might never have gotten this amazing comic.) Teaming up the newest Eclipse with someone from the prior generation of heroes, Roberson gets a chance to comment on the nature of the hero-villain dynamic, even while Rex himself completely takes down the idea of villain team-ups and their general uselessness. With Culver providing visuals that alternate between serious and silly, we not only get two great takes on superheroes, Roberson gently nudges the overall plot along at the same time. My favorite issue, without a doubt, however, is nine, which features Roberson and Culver's take on Mr. Myxlplyx in the form of ROFL. He does pretty much all the same things, but has a sharper edge to his mirth and is none too pleased with Rex for interfering in his relationship with Valiant. He, like the heroes, is watching Rex carefully--but unlike them, he has skills that Rex just can't match. While all of the issues are drawn amazingly well, with Culver easily creating characters that echo the world of DC Comics without feeling cloned, it's issue nine that puts him among the elite. Over the course of the issue, Culver has to draw in his usual style but also switches effortlessly from a Dan Jurgens pastiche, a manga, and the best Rob Liefeld impression this side of the artist himself. Completing the job by making ROFL move around just as though he were a puppet from Henson Studios (right down to the flailing arms), Culver's chops are unbelievable. Lots of artists will switch their styles up, but not all of them can do it so easily--or so well--as Culver completes the job in this issue. One more note about nine before we move on. In addition to the artistic wizardry of the issue, Roberson and Culver take advantage of not worrying about page counts by placing Rex and ROFL in wide-open white space, highlighting Rex's helplessness and showing that like the creators themselves, ROFL can change the white into vibrant life at will. It's meta without hammering the reader over the head, and absolutely brilliant work. Golden Age Goodness. Culver's Fox. Another thing about Edison Rex that I enjoy is how well the story links together. Issue seven gives us an origin story, teasing a Batman-like scenario then shifting to Rex as a young hero in training, only to feel upstaged by Valiant. This is all in the backdrop of someone called Gladstone, who was a big influence on Rex. When we get to issue eleven, which is set in the past, Gladstone returns and his interactions with Rex make the scenes poignant in a way they wouldn't have if there wasn't a set-up issue first. Working in the Golden Age gives Culver another chance to show off his chops, designing costumes that look like they'd fit in the 1940s/1950s time period of the story. These are characters in full suits, corny masks, and lush capes, ideas whose time came and went. It's little touches like that that make Edison Rex the comic that it is. Not only do Roberson and Culver have the knowledge to create an epic story that takes its premise and carries it beyond the simple one-note plots that others may have tried, they've got the skills necessary to pull it off successfully. Edison Rex may originate in the kind of discussions you have over a few beers after a day a a comic-con, but this is no mere idle speculation. It's a series with its own weight, featuring a compelling main character trying to do the right thing, from his perspective, and those who might try to bring it all down around his ears. This may be the best comic you're not currently reading. If you have access to a digital device, I cannot recommend trying this series enough. I just about guarantee it will hook any superhero fan--and maybe a few who aren't, too.